A chuckle-worthy camp confession recently spotted on Pinterest: “My wrists did not see sunlight all summer because of the bracelets.” Anyone who has ever attended or worked at a sleepaway camp is all too familiar with the “bracelet tan.” Of the thousands of camps across America, there is not an Arts & Crafts area that is not well stocked with beads, lanyard, skeins of embroidery floss, paracord, rubber bands and just about anything else that can be turned into a bracelet. Bracelets are BIG at camp. They’re not merely wearable art. They’re a symbol of friendship. Few campers or staff actually keep the bracelets they make for themselves. Instead they exchange them with friends and other special people at camp. Although people have been making friendship bracelets since ancient times, they have become a camp tradition. It’s fun to conjure memories of a special person with a glance at one’s wrist. The act of making the bracelets is almost as pleasurable as the bracelets themselves. Friendship bracelets are also easy to make, and campers of all ages easily catch onto the various ways of braiding and weaving materials into fashionable designs. Friendship bracelets also appeal equally to both boys and girls. The fact that making bracelets takes very little concentration makes them the perfect social craft. It’s easy to interact with others while making bracelets at camp. Bracelet making is the perfect conversation opportunity and bonding activity. The row of bracelets is not just camp fashion, it’s a storyboard of the summer that is unique to every individual at camp. It represents who they met during the summer and the special moments that have been committed to memory. One the best things about friendship bracelets is finding them tucked away long after the summer has ended, and having a moment to remember the summer and the people and stories behind each bracelet. This entry was posted in Uncategorized and tagged American summer camps, camp activities, camp crafts, camp friends, camp laurel, camp memories, camp stories, camp traditions, friendship bracelets, sleepaway camp on June 12, 2014 by admin. Camp provides the perfect backdrop to a sunset. Watching the sun dip below the tree line and catch the reflection of the water before finally disappearing into the horizon as the campus slowly lights up isn’t just a classic picturesque image of camp, it’s symbolic. It signals a shift in the camp day. The daily activities have ended and now it’s time for the evening to begin. Sunset at camp signifies dinner. Dinner is an important activity at summer camp. It’s a time for everyone to come together and tell stories about their day as they share a meal as the daylight slowly transitions into a star filled night. With the sunset also comes campfires. 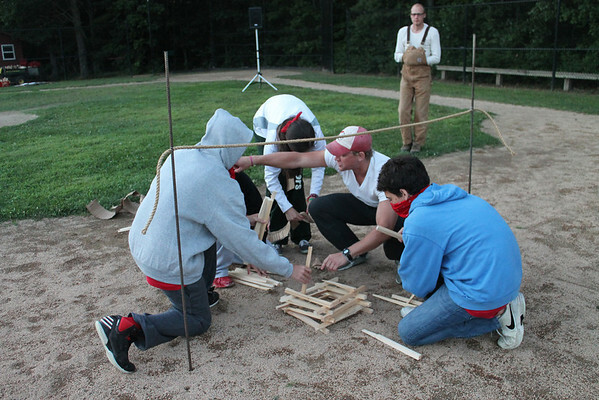 Each camp has its own unique campfire traditions. But the one thing they all have in common is that campfires happen after the sun goes down. Whether it’s entertaining each other, singing songs or eating s’mores, sitting around a campfire at night helps everyone tune into the environment around them and take in the magic of summer camp. The sounds of campus become more amplified. The smells become more distinct. Campers and staff alike also know when they see the sun begin to set that it’s almost time for evening activities. 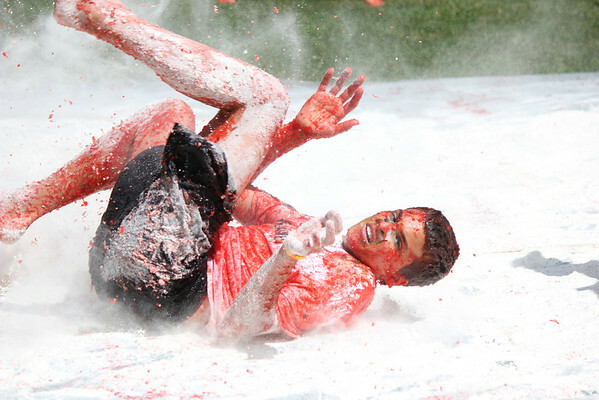 Evening activities are some of the most action-packed and anticipated moments at camp. Sometimes the entire camp participates in evening activities together while at others separate activities are held for different age groups. It’s so easy to not even notice the sunset during the ten months when one is not at summer camp. But at camp, sunset is something that just can’t be missed. Not only is it an important part of the camp day, it’s nice to take notice of such a beautiful transition and to understand that taking notice of it is a special part of camp. This entry was posted in Uncategorized and tagged American summer camps, camp evening activities, camp laurel, camp traditions, campfires, evening activities at camp, evenings at camp, sing alongs, sleepaway camp on May 10, 2014 by admin. This entry was posted in Uncategorized and tagged American summer camps, camp activities, camp evening activities, camp laurel, camp memories, camp programs, camp traditions, sleepaway camp, special activities at camp, special camp programs on January 28, 2014 by admin. The holidays are upon us and ‘tis the season to ponder those things for which we’re truly thankful. For those of us who are fortunate enough to eat, sleep and breathe camp 24/7, 365 days a year, it’s hard not to make an exclusive “Camp Laurel” list. After all, camp is just as much a part of our lives in November as it is in June. So we figured we’d share some camp things for which we are thankful all year long. 5.) A beautiful campus. That first drive into camp each summer is always so special. No matter how many times we’ve been there, that first glance of the bunks/cabins, the dining hall, the fields, the courts and the waterfront each summer is something we anticipate all year long. This entry was posted in Uncategorized and tagged benefits of summer camp, camp families, camp friends, camp laurel, camp memories, camp programs, camp staff, camp traditions, summer camp, value of summer camp on December 3, 2013 by admin. Parents: By now your pantries are empty, your laundry rooms are full, and your television remote controls are affixed to your children’s hands. The campers are home, and they’re riding a camp high. They have a lot to tell you. Get ready to hear a lot of stories about camp (over and over), be let in on a lot of inside jokes that you probably won’t understand because “it’s a camp thing” (laugh anyway), learn everything you could ever want to know and more about new friends (excellent excuse to look at camp photos again with your children), and listen to camp songs and cheers (they’ll likely want to teach them to you too). Sometime around mid-September, you’ll probably start wagering with your spouse about whether your children will stop talking about this summer before next summer starts (not likely). You’ll try to start conversations about things other than camp (you’re pretty sure you’ve seen an episode or two of Pretty Little Liars),but inevitably the conversation will come back to camp. (Remember the episode when Spencer realized that she’d been to summer camp with Hannah’s stepsister? And speaking of camp…) But just when you’re starting to feel camped out, something will happen this fall that will make you remember why you love hearing about camp. Registration for next summer will open. You’ll remember that this is the point every year when still hearing about this summer even though it’s time to start thinking about next summer transforms into music to your ears, and the lyrics are your children’s way of telling you that they love camp (even though by that time they’ve said they love camp about a million times). You’ll think about everything they’ve shared with you about camp, try (and fail) to count how many times they’ve used the word “camp” since they’ve returned home, and maybe even admire some of their arts & craft handiwork as you pat yourself on the back for deciding to give your children the gift of summer camp (then you’ll check the camp website for the Visiting Day 2014 date). This entry was posted in Uncategorized and tagged American summer camps, benefits of summer camp, camp activities, camp friends, camp laurel, camp memories, camp traditions, end of summer camp season, sleepaway camp, value of summer camp on August 12, 2013 by admin. This entry was posted in Uncategorized and tagged American summer camps, camp traditions, sleepaway camp, summer camp activities, summer camp programs on July 23, 2013 by admin. Actress Jami Gertz, a summer camp alumni, once said, “There is something very special about being away from your parents for the first time, sleeping under the stars, hiking and canoeing.” Although on the outset this seems like just another quote about summer camp, the use of the word “special” makes it standout. “Special” is defined by Merriam-Webster as “distinguishable,” “superior,” or “of particular esteem.” Every camp, when planning the summer, strives to create an experience that sets it apart from other camps. To those whose exposure to summer camp is limited to Hollywood’s interpretation of it, there may seem to be little that distinguishes one from another. However, to those who attend or have attended summer camp, each one is unique from others. For campers and staff alike, to think of the more than 12,000 summer camps throughout the United States as a collective summer experience is to think of all pizza as having the same flavor. Sure the basic ingredients are the same. Most pizza pies even look similar. But, depending on which toppings you add, one pie might taste very different from another. It’s that special flavor of each camp that gives it that “esteemed” place in the hearts of those who have called it their summer home. 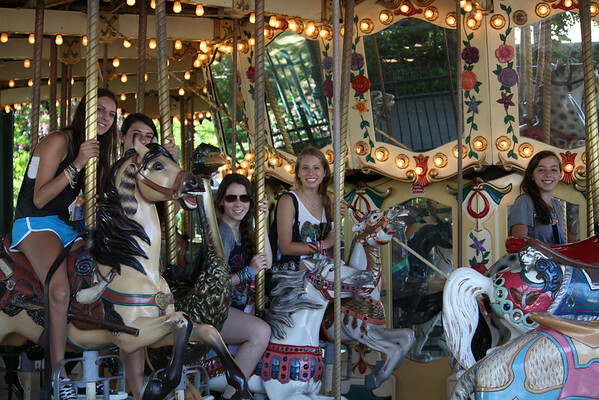 Choosing a camp is more than simply deciding to send your child. The values, traditions, activities, facilities, staff, and even the duration all play a role in deciding at which summer camp your child will find the most success. In a couple of weeks, another summer will start, and thousands of young campers will taste summer camp for the first time. They’ll spend their first night sleeping in a bunk/cabin with fellow new campers. They’ll bond with favorite counselors. They’ll try at least one activity for the first time. They’ll make new friends, learn new songs, and, for the first time, experience life away from their parents. As Jami Gertz said, it will be “special” as they begin gaining the independence, self-reliance, and self-confidence that are all-important ingredients in creating a life that is “distinguishable.” Ultimately, however, the role that summer camp plays in the successes of the lives of campers as children and, as they mature, in helping former campers meet the challenges of adulthood does not simply come down to experience but also in the choice of summer camp. So whether you’re just starting to consider summer camp, have begun searching for a camp, or will be one of the thousands of prospective families touring summer camps this year, be on the lookout for the right mix of ingredients that will create that “special” experience for your child. This entry was posted in Uncategorized and tagged American summer camps, benefits of summer camp, camp activities, camp laurel, camp traditions, Choosing a Summer Camp, sleepaway camp, value of summer camp on June 10, 2013 by admin. This entry was posted in Uncategorized and tagged American summer camps, benefits of summer camp for teenagers, camp laurel, camp rituals, camp traditions, sleepaway camps, summer camp activities for teenagers, summer camp programs for teenagers, the value of summer camp for teenagers on April 4, 2013 by admin. This entry was posted in Uncategorized and tagged American summer camps, benefits of summer camp, camp activities, camp laurel, camp memories, camp traditions, sleepaway camp, summer camp, value of summer camp on March 10, 2013 by admin. We recently listened to a man who has spent many, many years studying the effects of play on humans. While it sounds a lot like our job as camp directors, he’s got the Ph.D. so we thought to give him our attention. We are glad we did. It overrides what is sometimes fixed in our natures – it brings individuals together in ways which allow them to expand their knowledge of others and the world around them. If the purpose is more important than the act of doing it, it’s probably not play. People who have not played with their hands (fixing and building) do not solve problems as well. The basis of human trust is established through play signals. We begin to lose those signals as we age. When you look at camp through the prism of these statements on play, you encounter a big ‘duh!’ moment. Watching our campers play together shows you how the common act of laughing together, or playing gaga, or chase, or different table games allows the kids to spread their wings and learn. While we have a good bit of unstructured play at camp but, there is also a great deal of play within teams such as soccer, basketball, baseball, dance teams, and more. Campers build trust with their teammates, learn from mistakes, and are taught to keep a great attitude throughout their time at camp. In woodworking, robotics, and ceramics, we give kids a great opportunity to explore with their hands and make, fix, and tear apart things they don’t normally at home. These experiences lead to wonderful outcomes both over the short and the long term. Thankfully, Dr. Brown reminds us that we, as humans, are designed to play throughout our lifetimes. We couldn’t agree more. And, since play signals help build trust, we hire camp counselors who show the right mix of maturity and experience while keeping playfulness close to the surface. We are excited to remain a place where play leads to several much needed outcomes: relationship formation, the development of confidence and independence, and a community in which campers know they are accepted. Whether through our traditions, choice based program, evening activities or during free time, our campers laugh and learn while playing! This entry was posted in Uncategorized and tagged benefits of summer camp, camp activities, camp community, camp laurel, camp programs, camp traditions, summer camp, value of camp on February 10, 2013 by admin.